Before divisive banter takes hold , let’s take a minute to celebrate Russell Westbrook’s 3rd straight NBA season where he averaged a triple-double. Going into the matchup Westbrook was only lacking a few meager assists to reach the milestone, which he eclipsed with 10:54 left on the clock in the first quarter. and his Thunder teammates were up against the Detroit Pistons with direct implications on the Eastern Conference playoff picture. Detroit’s eventual loss to the Thunder on Friday loosened their grip on the 8th and final playoff spot they are safeguarding from an upstart Miami Heat team that is motivated to reward Dwyane Wade with one final postseason push before retirement. 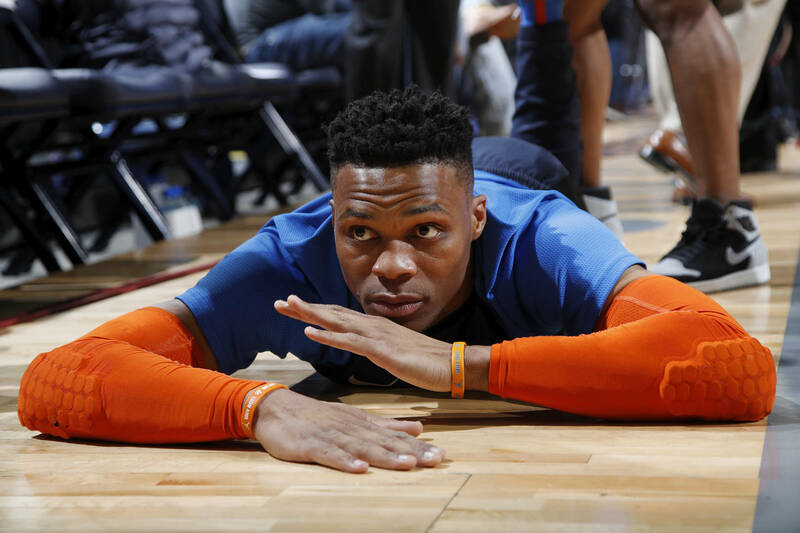 Westbrook Friday night stat line of 19 points, 15 assists and 8 rebounds brought his season averages to 22.9 points, 10.6 assists and 11.1 rebounds per game. After the game, , himself an this term, spoke to the press about his unblemished opinion of Westbrook’s career to date. “He’ll go down as a Hall of Famer, one of the best,” George said. As for the team’s playoff hopes, they could yet slip to 8th in the West if the Spurs pass them in the final 3-game stretch. A Thunder vs. Warriors matchup would be one hell of a first-round series.